It was just last week that I was reading reports in the media about how there had been a record 33 days in a row during December 2013 and January 2014 where the temperature hadn’t fallen beneath freezing. Since 1900, to be exact in 1936 and 1948, there have only been two other winters with less than 10 similarly cold days. However, on Friday, as had been predicted all last week, winter most definitely arrived as temperatures plummeted and what started as rain soon turned into snow. Since then it has been dry but with temperatures struggling to get above freezing, the snow could be here for some time, especially since more is forecast for the days to come. The amount of snow, at ground level at least, wasn’t significant and therefore currently the pavements and streets are still snow free. 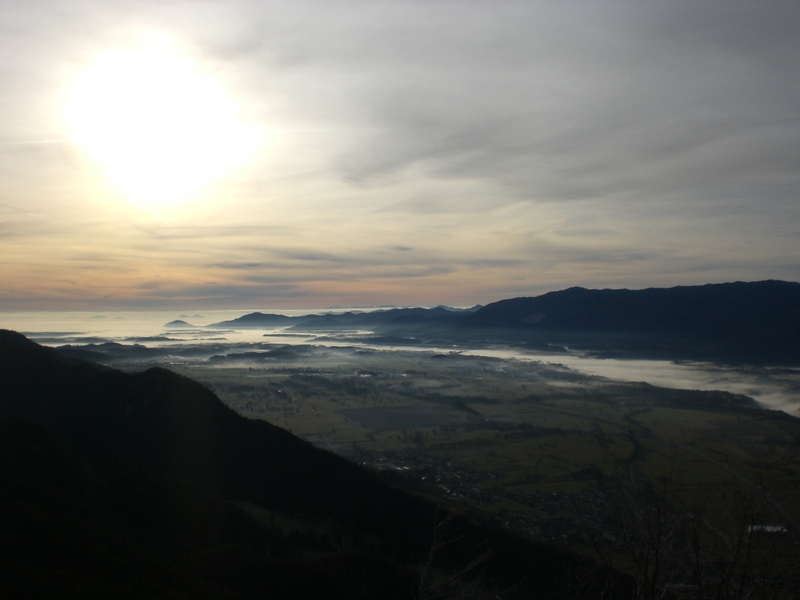 The warmest winter on record in Slovenia was the one of 2006/2007, which was coincidentally the winter that I moved to Slovenia and thus led me to (falsely) believe that winters in Slovenia were mild and sunny. There have been a few since then that have proved me wrong! Of course many people couldn’t wait to get out and partake in some ‘snowy’ activities, be it skiing, sledging or just snowball fighting! Although everyone who knows me knows I’m not a fan of the white stuff, I actually don’t mind it when it’s where it should be i.e. in the mountains, and one can choose to go and enjoy it if so desired. So, when on Saturday morning I woke up to see beautiful blue skies and sunshine, I too couldn’t resist the temptation. After a short deliberation about where to go, I settled on a walk from Kranjska Gora to Vršič, which is always scenic whatever the season. 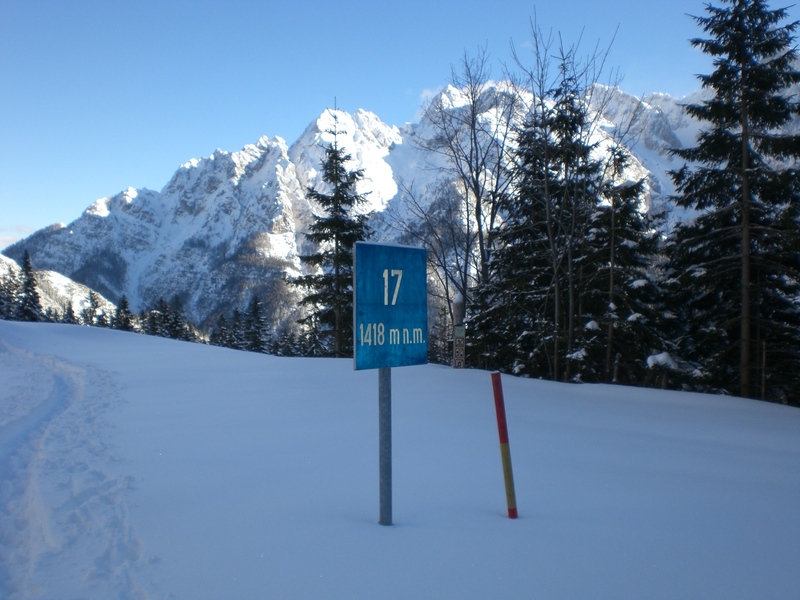 At 1611m, Vršič is Slovenia’s highest mountain pass and was built in 1915 by Russian prisoners of war on the order of the Austro-Hungarian authorities to facilitate access to Kranjska Gora. 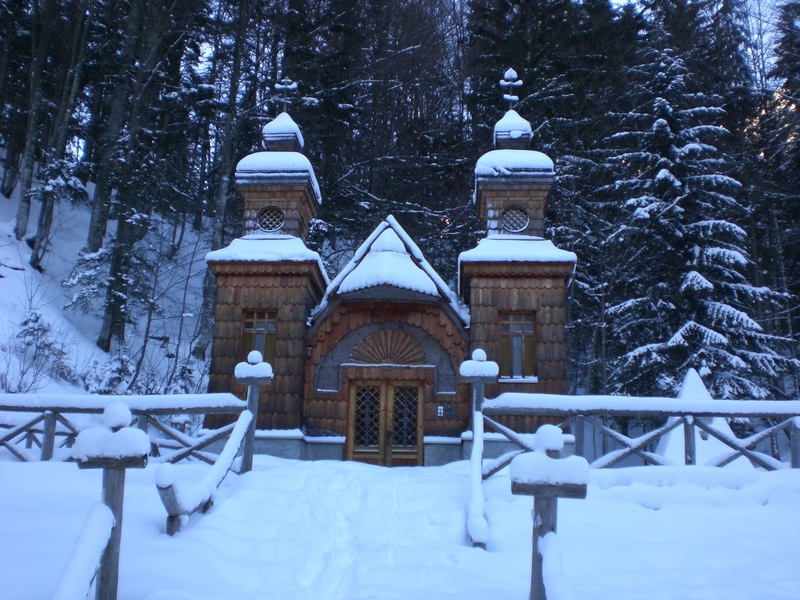 During its building, in March 1916, an avalanche buried a prisoner of war camp, killing over 300 prisoners and the Russian Chapel (seen below), built in a typical Russian design, was built by the remaining prisoners in memory of those who died. 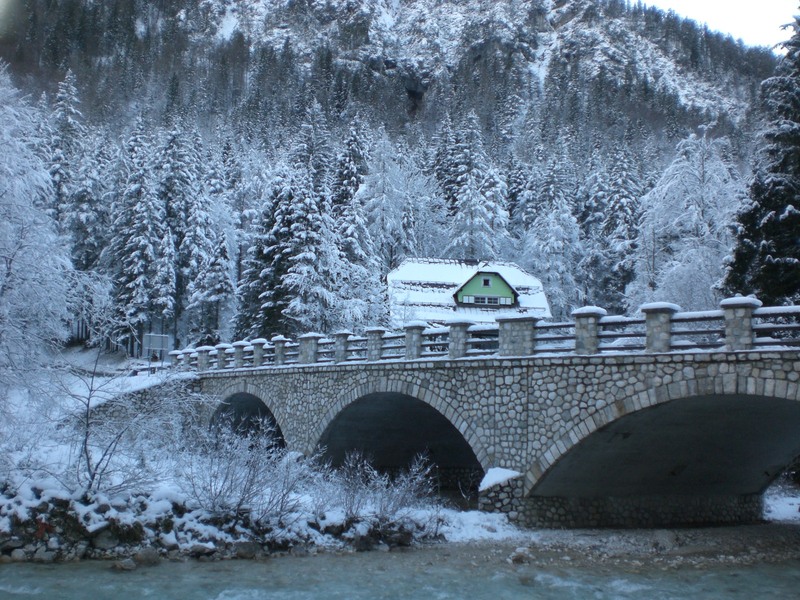 Vršič crosses the Julian Alps from Kranjska Gora in the Sava Valley to Trenta in the Soča Valley. As well as being a vital link between the two areas, during the summer Vršič is also a highly popular tourist attraction in itself, with a number of sights to see and places to stop enroute to the top. The pass is usually closed for the entire winter as it is not snow ploughed and is susceptible to avalanches. Last year there was up to 8 metres of snow in places and despite workers working 10 hours a day to clear it, it didn’t reopen until May. This year, so far, there is significantly less but it’s still not driveable. The road was partly ploughed up to the hut Koča na Gozdu but only suitable for 4-wheel drive vehicles or those with snow chains. There after, well you wouldn’t even know it was a road! I parked beside the bridge over the Velika Pišnica river and began walking along the path towards Krnica, with the intention of turning off to the right to cross the v Klinu pasture to join the road to Vršič a little higher up, this being more interesting and scenic than walking up the road. 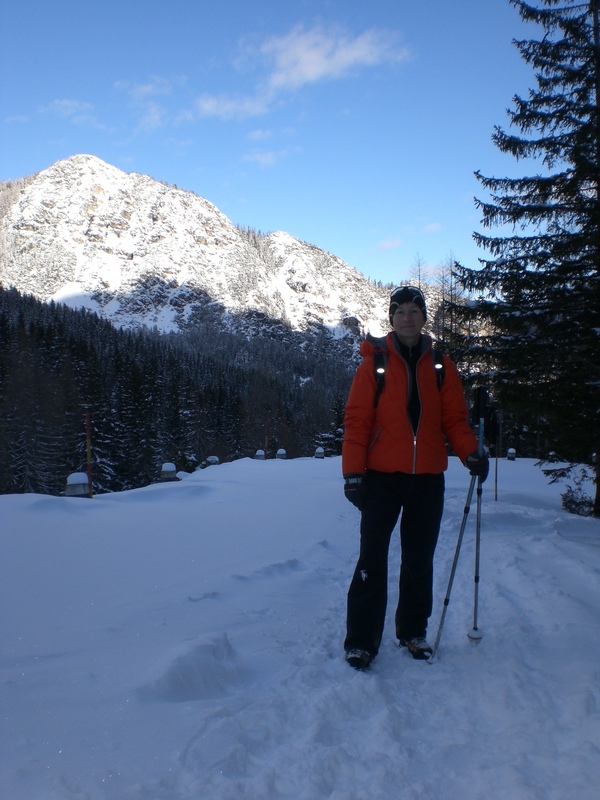 However, on reaching the pasture and trying to trudge my way through the knee deep virgin snow, I thought better of it and instead walked to the Krnica mountain hut, 1113m (Koča v Krnici). 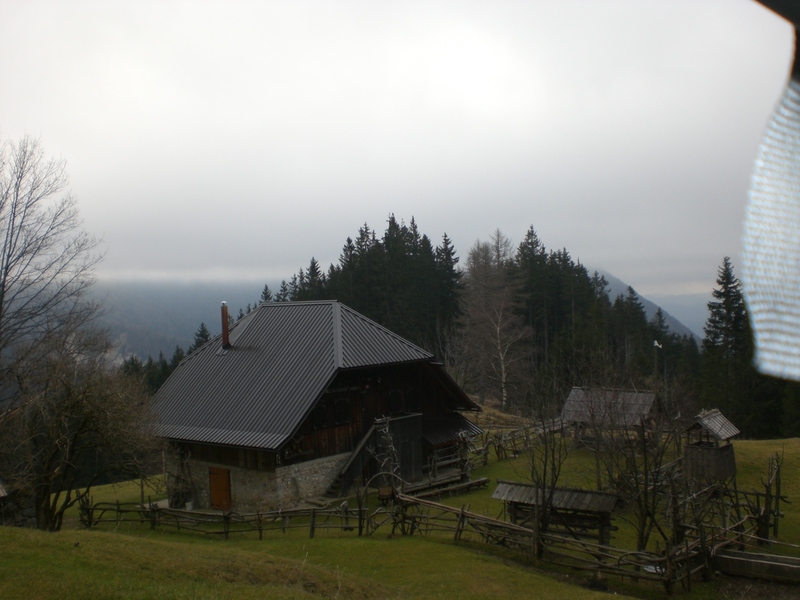 The hut is set in a clearing beneath the walls of Križ and with views of the mighty Škrlatica, Razor and Prisojnik mountains and offers beautiful views and is also a starting point for other demanding hikes, for example to Križ. It is usually open at weekends during the winter and daily during the summer. The path leading to Krnica is also a very popular sledging track, as witnessed by numerous trees complete with crash matting! 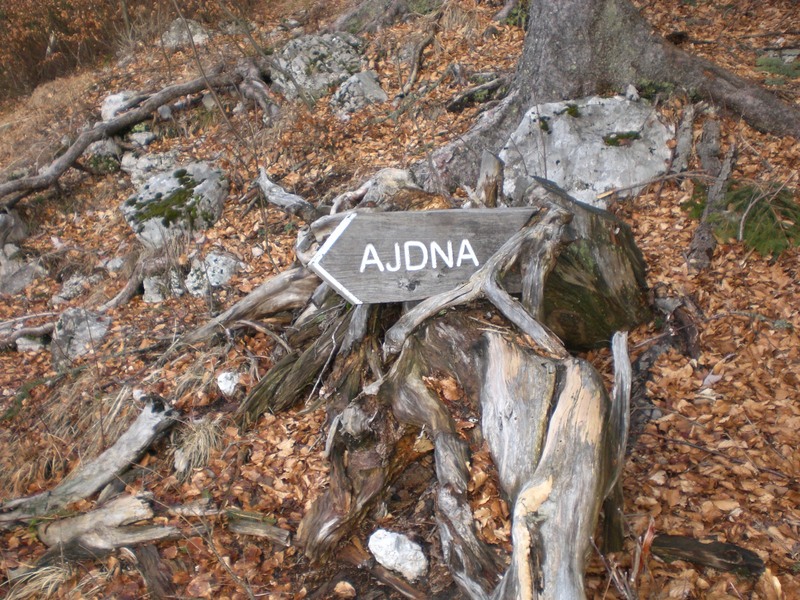 Imagine my delight then when, on making the return, I saw there was now something of a route across the aforementioned pasture, presumably made by one of the branches of the Slovene mountain rescue team who were there carrying out a training session – my lucky day! This pasture is home to the Mali Tamar memorial, which was erected in 1998 in memory of all those who have died in the mountains surrounding Kranjska Gora. Meanwhile, back down on terra firma, here’s some non-snowy ideas for the coming week in Radovljica. There will be a concert of Russian music taking place in the Baroque Hall of the Manor House (graščina) on Thursday 30th, beginning at 7pm, and organised by the Chopin Golden Ring. Tickets cost from 10 euros for adult and 5 for children. On Sunday 2nd February the monthly flea market will take place in the old town centre (or in the entrance lobby of the Manor House in the case of bad weather) from 9am to 1pm. The event also includes additional activities for children. Entrance is free. The ever popular outdoor skating rink at the Radovljca Sport Park is open daily, midweek from 3-6pm, weekends from 10am-6pm. Kids (with their own skates) can skate for free, adults pay just 2 euros. 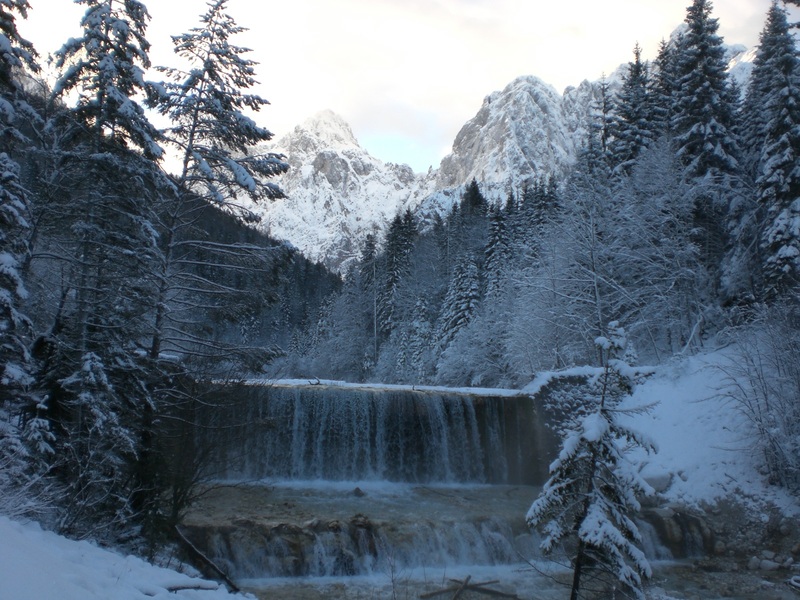 This year’s winter, thus far at least, has been a total antithesis of the previous one when there was SO much snow that even some of the die-hard snow fans, of which there are many in this Alpine region of Slovenia, began to tire of the relentless snowfall. This year however, until now at least, the precipitation has all been in the form of rain and with the mild temperatures to boot, even the weather forecasters are being left scratching their heads. However, I’m not usually one to be deterred by a bit of rain, after all it’s only water, and in some countries of the world they would give their eye teeth for rainfall. After so much time spent snow shovelling last year, the novelty of which quickly wears off, believe me, I’m not complaining. I usually still don my waterproofs and head out for a run or walk, even if I do sometimes return home resembling a drowned rat! This week, I did at least manage one dry, albeit somewhat muddy, walk to the Planinca and Poljška mountain highlands. 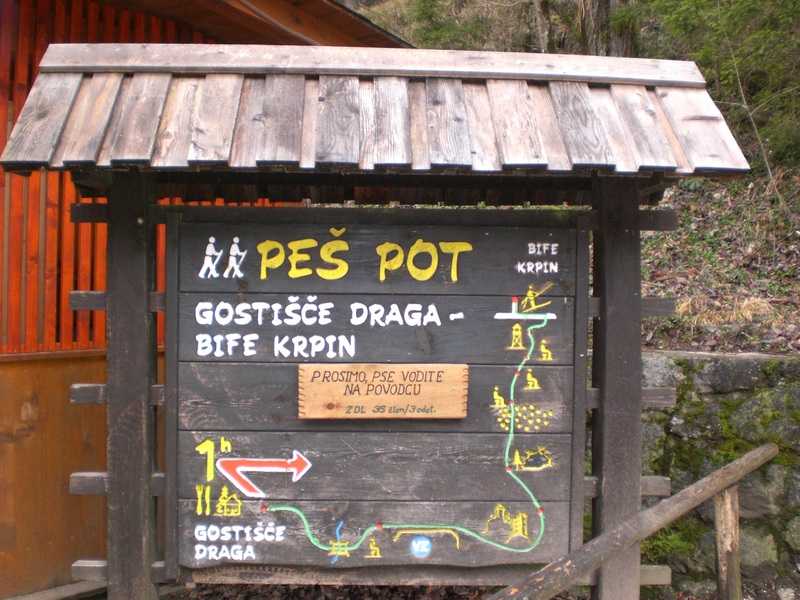 The usual starting point for a walk here, and to other destinations in the Karavanke range such as the ever popular Roblek Hut (Roblekov dom), the Preval highland and hut (Koča na Planini Preval-a) and the peak of Begunščica (the 2nd highest peak in the Karavanke range), is from the parking area at the foot of the Draga Valley. 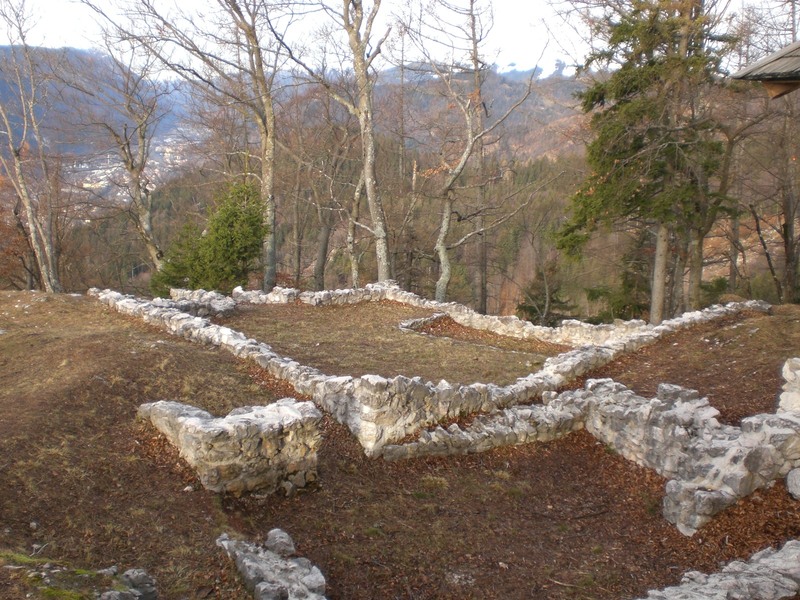 On this occasion however I chose to begin my walk along the pleasant and interesting Lamberg’s path which leads from the Krpin recreation area in Begunje, past the ruins of Kamen Castle (Grad Kamen), before reaching the Draga Valley. The path takes about 45 minutes (in one direction). The path from the valley head is well marked and leads first up the mountain road before branching off into the forest. It is an easy, though fairly steep in parts, hike up to reach the first mountain highland, Planinca (1136m). This was originally owned by the Lords of Kamen and was formerly used for grazing cows and sheep. These days, cattle can still be found grazing here during the summer months and one can stop at the Planinca hut for a refreshing drink or some soured milk (kislo mleko), direct from the herd. The soured milk is actually akin to a natural yoghurt, thick and most often served in a clay bowl and eaten with a spoon. I have to confess that I’m not a fan but it is a very popular delicacy of choice around here! During the winter, or rather during a ‘normal’ winter, the road from the Planinca highland back down to the valley is transformed into a very popular sledging track. Of course with the lower section of the road being shared by both hikers and sledgers, one does have to keep aware to avoid being taken out by a fast finishing sledger! A mere ten minutes almost level walk from the Planinca hut leads to the Poljška highland and hut (1180m), so named as it belongs to the community of the nearby village of Poljče. The pasture was also used for grazing horses, cows and sheep. 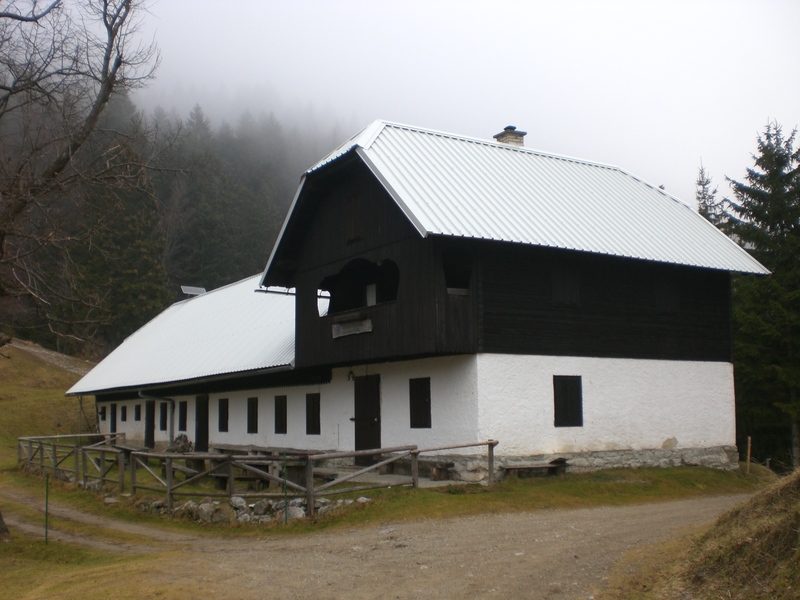 The Poljška hut is a large chalet style design which, after being burnt down during in 1944, was restored to its original form after the war. 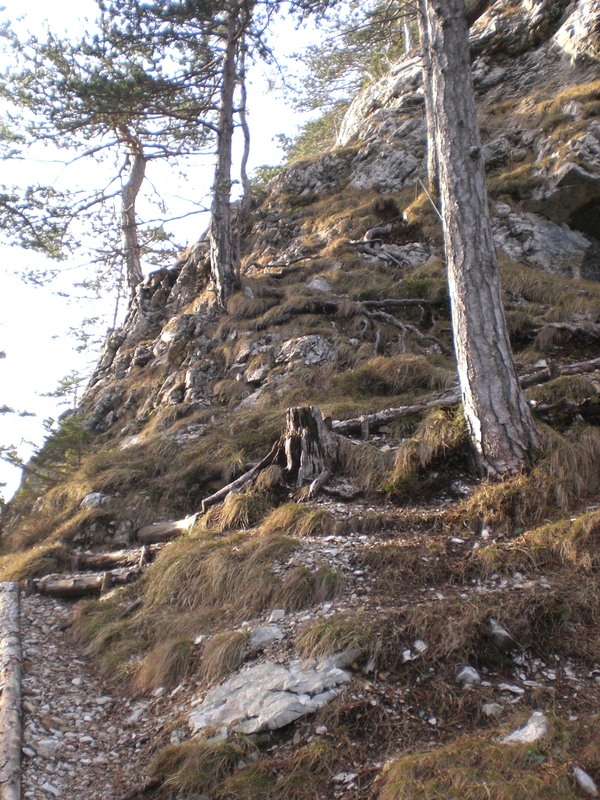 The mountain road ends at the Poljška highland and from here a path continues up through the forest to the Roblek Hut (1672m). Alternatively, as I did on this occasion, a path to the left of the pasture leads down through the forest before reaching a junction where one has the choice of continuing, at first uphill then again downhill, towards St. Peter’s Church (Sv. 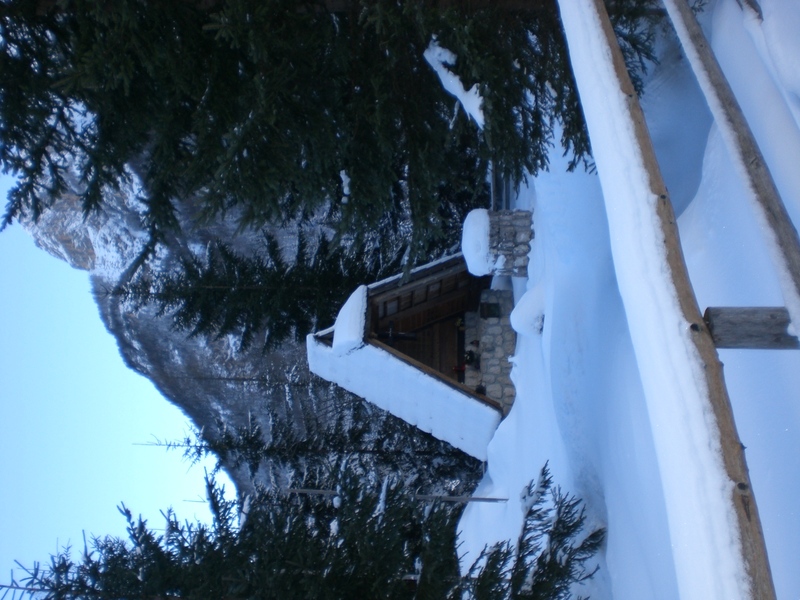 Peter) and the Sankaška hut (Sankaška koca), or turning left down a gully to return towards Begunje and the Krpin recreation area. Of course all of this mild weather and rain is having a hugely detrimental effect on the low lying ski resorts such as Kranjska Gora. The higher resorts however have more than enough snow, with more falling all the time, but they just need some fine weather to entice the skiers out onto the slopes; not that Slovenes need any encouragement to go skiing. 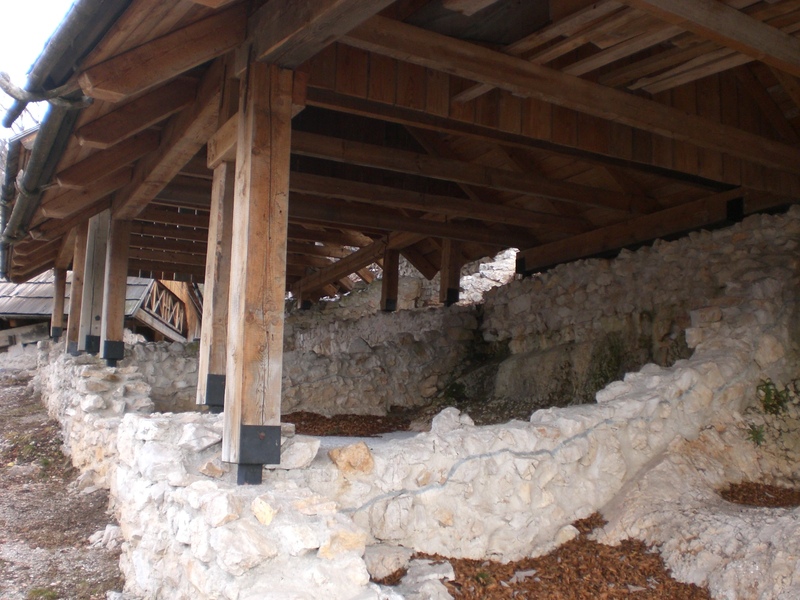 For those not so keen on venturing out in the inclement weather, there are other indoor activities in the Radovljica area such as the Olympic size swimming pool (covered during the winter, open-air during the summer), Linhart Hall cinema and theatre, the museums and galleries in Radovljica’s old town centre (Museum of Apiculture, Town Museum, Šivec House Gallery), as well as museums in the surrounding villages of Begunje (Museum of Hostages) and Kropa (Museum of Iron-Forging). Additionally, this week, a new photographic exhibition will open in the lobby of the Radovljica Mansion (graščina) on Friday 24th January at 6pm and next weekend the 8th International Accordion Competition for the Avsenik Award will take place at the Avsenik restaurant in Begunje. Entrance to all these events is free. This year, I chose to see out the old year and see in the new year at a local venue which can definitely be regarded as being one of Slovenia’s success stories of 2013; somewhere bucking the trend of the recession, daring to be a bit different, and where the owners believe in supporting and co-operating with the local community to offer delicious, locally sourced and creative food served amid a pleasant ambience – Vila Podvin. Vila Podvin is located in the village of Mošnje, just a couple of kilometres from Radovljica. When I first moved to Slovenia there was another restaurant open here but it closed down some years ago and had since remained shut. I regularly run past the restaurant and had often thought to myself what a shame such a beautiful place, with its adjoining, albeit abandoned, castle, had been abandoned and lain empty for so long. So it was with delight that earlier this year, on another such a run, I noticed work was taking place and the restaurant looked as if it was being given some much needed TLC. On my return home, I immediately set about sending emails to discover what was afoot and was delighted to discover that Vila Podvin was about to re-open and, even better, that its head chef was to be Uroš Štefelin, one of Slovenia’s best known chefs. Uroš (the brawns?!) together with the Director, Marcela, (the brains?!) both previously worked at the prestigious Hotel Triglav in Bled and it was there that they decided they wanted to ‘go it alone’ without the constraints of working for someone else. Uroš Štefelin is one of the three reknowned ‘Bled Chefs’, the other two being Bine Volčič, who previously headed up the Promenada Restaurant in Bled and Igor Jagodic who now heads up the team at Ljubljana Castle’s prestigious Strelec restaurant. Despite all three chefs being very successful and adding their own twists and specialities to their food, all three now share a compassion for tradition, which is the underpinning story of these times. 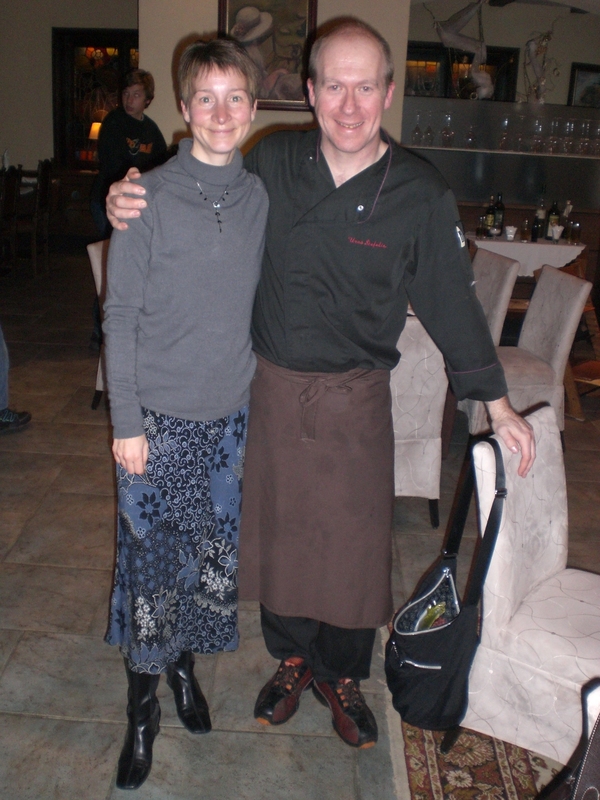 Here’s me with the great man himself – Chef Uroš! So, as you might imagine, I was delighted at the opportunity to spend New Year’s Eve with them and sample some of the delicious food I had been hearing about. I will hold my hands up and admit that whilst I love food, and I’m open to trying unusual and exciting new flavours and dishes, I am by no means a gourmet. Thankfully, I didn’t need to be as the menu choices were taken care of. I must also confess that I am not usually at home in posh, stuffy restaurants, where one must mind their ‘p’s and q’s’ and has to hunt around the plate to find the food. 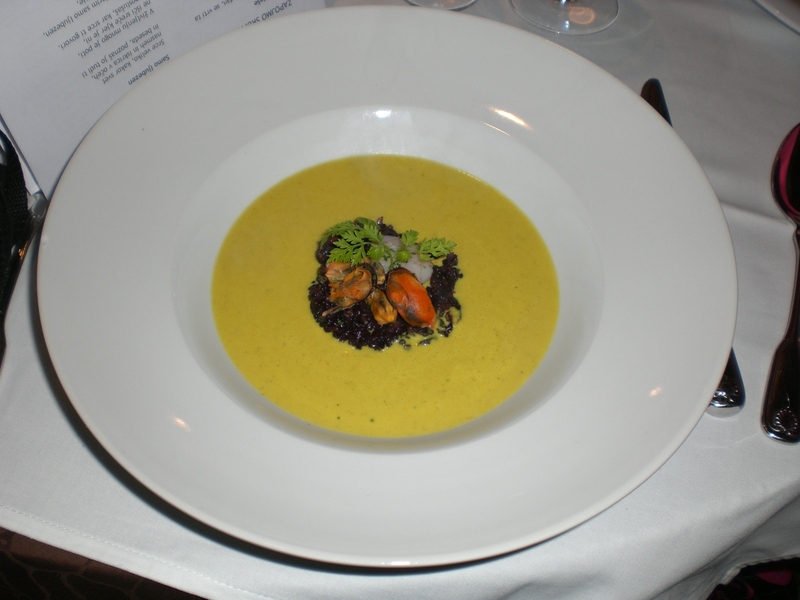 Fortunately, again this was far from the case and I was made to feel most welcome; there was a friendly, family, relaxed atmosphere and I certainly didn’t leave hungry; my favourite dish being the excellent curry soup with black risotto (as seen below) and the hemp gnocchi were also a hit! Oh and there was a surprise visitor too! 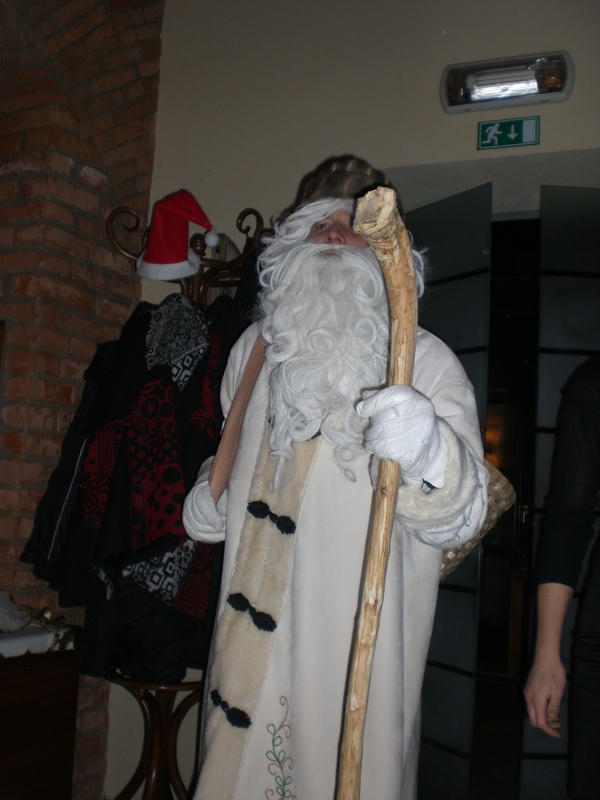 After the meal, the celebrating continued in the old town centre of Radovljica with live music and a few warming schnapps! In line with their passion for sourcing local foods and supporting the local community, a market is held in the grounds of Vila Podvin on the first Saturday of each month. In addition to being able to sample and buy products from local suppliers, visitors also have the option of staying for lunch which Uroš rustles up using products available from the day’s market. Personally, I have always enjoyed shopping at markets. Granted, the food may sometime be a little more expensive but it’s fresh and you know its exact origins. Indeed, since moving to Slovenia I have become more aware of such things and endeavour to cook almost all my meals from scratch. These days, when I visit the UK, I look in dismay at the aisles upon aisles of chilled and ambient ready-meals that line the supermarket shelves and it horrifies me to think of purchasing any of them. Not that there isn’t a place for certain ‘off-the-shelf’ products; ready-made pastry is a boon, tinned tomatoes for making pasta sauces etc. too and sometimes of course one simply otherwise doesn’t have time. After all this, I feel as if I’m turning into a restaurant critic – my next career move perhaps?! So to other news. Well – it’s wet! But the precipitation has been largely in the form of rain rather than snow. It’s also unseasonably warm with temperatures of around +5-10 degrees, whereas usually at this time of year it would be in the minuses. I have read several enquiries from worried visitors about the amount of snow around for skiing so I will endeavour to post a short snow report update each week for the remainder of the season. Currently, much of the snow beneath the 1500 metres level has been washed away although of course in the high mountains, there is a lot of fresh now, up to 2 metres, and the danger of avalanches is significantly increased. Lower lying ski resorts, such as Kranjska Gora, are looking rather ‘green’ at the moment but the higher resorts such as Krvavec and Vogel, still have plenty of snow. Therefore I haven’t been able to do much in the way of hiking of late, either because its been raining at lower altitudes or because it would be unsafe and/or unwise of me to go to the higher mountains. This week I did make it to my usual winter haunts of Valvasor (1181m) and also to Smokuski vrh (1122m), both of which were pleasantly snow free, if a little muddy. As I write, I can see blue sky for the first time for a while so here’s hoping I will be out and about in the next few days and be able to post more trip reports and photos of hikes etc. soon.